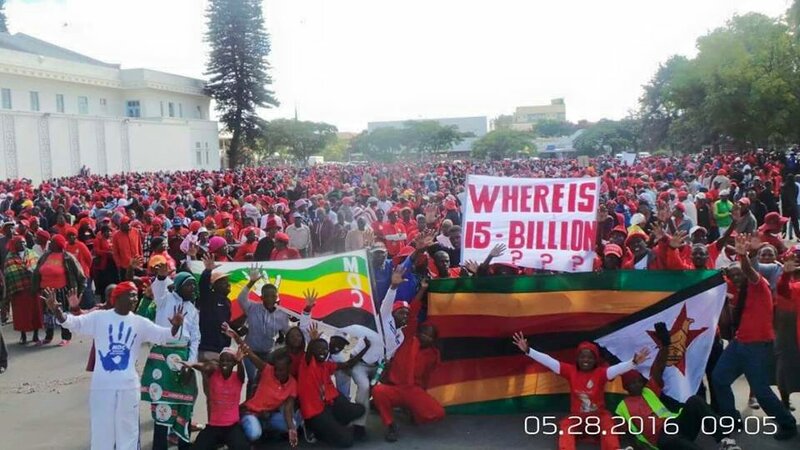 Tens of thousands of MDC-T supporters yesterday took to the streets of Bulawayo to demonstrate against President Robert Mugabe’s alleged misrule, days after the veteran ruler addressed his party’s huge rally dubbed the million-man march in Harare. Mugabe told his supporters he would hang on to power at all cost and they agreed he should die in office. First Lady Grace Mugabe said her husband should even rule beyond the grave. The MDC-T protestors from all over Bulawayo mocked the Zanu PF march describing it as a farewell party for the 92-year-old Mugabe. Marchers started arriving as early as 6am on foot, bicycles, kombis and private vehicles. The march started from the Bulawayo City Hall car park into Robert Mugabe way through 9th Avenue and Joshua Mqabuko Nkomo Street, ending at the Lobengula Kraal Inxwala open space near Northend where the crowd was addressed by the party leadership. Former Zanu PF Hurungwe West MP and Yard leader, Temba Mliswa joined MDC-T leaders, among them acting president, Thokozani Khupe, chairman, Lovemore Moyo, his deputy Morgan Komichi, secretary-general, Douglas Mwonzora and organising-secretary Abednico Bhebhe. There were a few police officers controlling the huge crowd. They also sang songs calling for Mugabe to “go back to Zvimba” while others praised MDC-T leader, Morgan Tsvangirai, who is recuperating at a South African hospital after undergoing an unspecified medical procedure. Bhebhe said it was pleasing that the people had overwhelmingly responded to the demonstration in order to tell Mugabe that it was time he quits power to allow for a younger leader. “If people demonstrate to say someone who is 92 must continue to rule, it does not make sense,” Bhebhe said. “We saw some people celebrating on Wednesday that they have no jobs and are suffering. Moyo commended the protestors for remaining disciplined throughout the demonstration, saying it was clear that the MDC-T was getting ready to rule Zimbabwe peacefully. “This shows that Bulawayo is MDC-T and many people in Zimbabwe are MDC-T. I have no doubt that come 2018 elections, we will be victorious,” Moyo said. Khupe told the MDC-T supporters that Tsvangirai had recovered and they were eagerly waiting to see him come to join the struggle. She said yesterday’s demonstration was also against the introduction of bond notes as announced by the government as this was tantamount to bringing back the much-loathed Zimdollar. She said Zanu PF was acting against itself by opposing what the people wanted and accused the ruling party of letting $15 billion diamonds revenue disappear under its nose. “As I speak, people are queuing trying to get their money from banks. Through this march, Zimbabwe is saying no to bond notes. Zanu PF must create an environment which will see people going back to work,” Khupe said. She said Zimbabwe was turning into a failed state as the majority of its people were surviving on less than $2 a day. Mliswa, who was introduced by Mwonzora, said he joined the protest because MDC-T was demonstrating against the “stolen” $15 billion. Mwonzora said the presence of Mliswa showed that Zanu PF was finished. “God is showing us that Zanu PF is finished. Mliswa who used to support them has left them,” he said. Last month MDC-T also held another demonstration against Mugabe in Harare that drew thousands of people. Unit we stand and divided we fall....! The Good Zimbabweans deserve better and a greater ruler to set things straight !! !